This is the best classic, smooth Clean Eating hummus recipe. 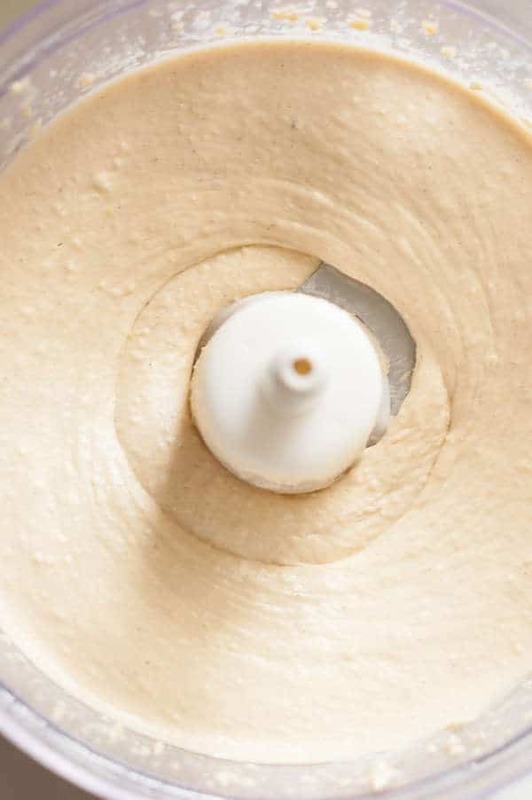 There is one simple, easy secret to making nice smooth hummus and I explain what it is. I also include the option to make hummus without tahini. Hummus is super-healthy, easy to make, and full of flavor. I pretty much eat hummus all the time. It is one of my favorite things to eat for part of my lunches. It is great to go with The Very Best Ever Healthy Clean Eating Pita Recipe or veggies, such as carrots or peas or my Easy 4 Ingredient Spelt Tortillas. Our smooth hummus recipe has a lot of flavor and is very smooth and doesn’t have an odd texture to it. Most of my children love hummus too and they love to eat vegetables with it. For those of you who have not met Hummus yet, let me tell introduce you. Hummus is a traditional Middle-Eastern dip comprised mostly of heart-healthy garbanzo beans. You can find hummus in many different flavors: horseradish; roasted pepper; curried; black bean; roasted eggplant; as well as many others. Hummus can be used as a dip, on sandwiches, and as a topping. I could go on and on about it! The secret to a perfectly smooth hummus is peeling the skins of the chickpeas off. It is definitely time-consuming but makes a HUGE difference. If you hold each chickpea between two fingers and pinch it a little, the skins will sort of just pop off. It adds about an extra 8-10 minutes to the prep time, but I think it’s worth it. You can make the hummus with the skins on, but it will not have the same smooth texture. Besides, my kids think it’s fun when they pop out of the skins and they like to do it. This is extra good with roasted red pepper on top. Just bake a red pepper until it’s charred on the outside and soft inside, then put it in a bowl with a lid on it, or plastic wrap over it or in a bag – just some way to steam it. Do that for about 10 minutes or so and then the skins come right off. Then just throw it in a food processor or blender. 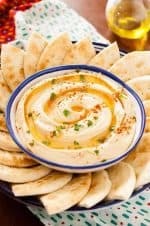 It’s so good and flavorful and not spicy at all and compliments the garlic in the hummus really well. Trust me. Now that I’ve tried it with the red pepper, I’m never going to eat it plain again. You can see me showing how to make the sauce in the video above. If you want some extra flavor in your hummus, don’t be afraid to experiment and add things like a roasted red pepper, jalapeno, sun-dried tomatoes, curry seasoning, green olives, red pepper seasoning or cucumber and dill. Or add things on top – like pine nuts, caramelized onions or blended roasted red peppers. Hummus is really good in place of mayo. on sandwiches or in pita bread and is good as a side with Middle Eastern food, like kabobs or Oven Roasted Chicken Shawarma. Why Is Hummus So Healthy? Hummus is made up mostly of garbanzo beans (chickpeas) which are often called the most nutritious food in the world. Garbanzo beans are loaded with fiber, which is helpful for proper digestion and proper digestion helps to boost your immune system and prevent diseases. A half-cup of garbanzo beans has about 143 calories, 27 grams of carbohydrates, and 6 grams of muscle-boosting protein. They are an excellent source of dietary fiber with about 5 grams in a half-cup serving. They are also nutrient-dense; packing magnesium, potassium, and iron! You get all of these benefits in the virtual cholesterol and trans-fat-free garbanzo bean! You can get garbanzo beans either in dried form or in a can. I prefer the canned beans since they are ready to use. It is very easy to find these beans in an organic variety, so if you are going for organic eating, this one is for you. A traditional Hummus is made with Tahini (ground sesame seed paste) but I never seem to have any just hanging around the house and I don’t particularly like the taste of tahini. Don’t worry if you do not have any at home, you can make a fantastic hummus without it! After you master the traditional hummus, feel free to play with your recipe to create some amazing hummus spreads (my favorite has to be horseradish or maybe roasted red pepper. I can’t decide . . .)! It will only take you about 5 minutes to make this amazing dip! You can serve your hummus dip with veggies, homemade tortillas, crackers, and flatbread. If often eat hummus for lunch, either a big bowl with some carrots and maybe some crackers as my meal. Or I really like to use it in place of mayo. on sandwiches or wraps. It’s healthier and I really like the flavor, especially if your sandwich has some Mediterranean flavors on it. And you never know who will like hummus. Our two little girls love it. When I first started eating it, I never even thought to offer it to them. It doesn’t seem like something a kid would like. Then they started stealing my baby carrots and dipping it in my hummus and eating it and loving it. Now I have to get some for them every time I make some for me (as long as it’s not too spicy). Do you have a favorite hummus variety? I would love to hear any adaptations, varieties or favorite ways to eat it. Please comment below. What can I use as a substitute for tahini in hummus? Tahini is a butter made out of sesame seeds. The recipe below substitutes peanut butter but any nut butter would probably work fine, but I haven’t tried them so I can’t say for sure. Some people just replace it with ground cumin and olive oil. I made this recipe and just left out the tahini, I didn’t replace it with the peanut butter but I did put extra cumin and olive oil in it and it tasted fine. It won’t taste the same for sure, it had a very mild plain flavor. Why do they put tahini in hummus? Tahini is very tasty to some people and gives the hummus and extra nutty flavor. Is tahini good for you? Tahini contains more protein than most nuts and milk. It is rich in B vitamins, vitamin E, magnesium, calcium, and iron. So yes, I would say it’s good for you. Can you use sesame seeds instead of tahini? Yes, you can. I found this HOMEMADE HUMMUS (USING SESAME SEEDS INSTEAD OF PURCHASED TAHINI) online. You might like to check it out. Hummus is a healthy and delicious snack – not to mention very easy and quick to make. These are all things I look for in a great snack. That is probably why I consume so much of it. 🙂 What do you enjoy eating with hummus? I would love to hear how I can make it more versatile. Comment below. You may enjoy this Yeast-Free, Quick Naan Bread to go with your Classic Clean Eating Smooth Hummus Recipe. The best hummus I’ve ever made! I will cut down a little bit on the salt – I use HP so it’s stronger – but otherwise, WOW!! Thanks. Good to hear. Thanks for commenting! Just made this! It is really good! Is a serving 1 Tbsp.? There are 8 servings in the recipe, so however much 1/8th of the recipe is would be the serving size. The cumin is part of what gives it the tahini-type flavor. If you don’t like that flavor, you can just leave it out. It will be quite bland though. I would make up for that with one of the optional mix ins I mention in step 4 of the recipe. I just made this and it was very easy. I had to use my blender and after much trial, figured that only on it’s lowest setting would it actually move/blend the mixture. I made the fatal (to me) mistake of using green pepper infused EVOO and the hummus is so hot I can barely eat it, but I know my husband – who can handle spicy things – will love it. I will definitely make this again (mild)!! Made this and it turned out amazing. Going on my list of favourite things! So good to hear! My favorite thing to add flavor is putting roasted red peppers in the food processor for a few seconds. So. good. Just made this to serve over brown rice & steamed veggies for dinner… oh my… hands down best hummus recipe I’ve ever tried! And yes, the skins were time consuming to remove, but wow it came out silky smooth, just like you would get at a restaurant. A couple of subs I made since I didn’t have some of the ingredients on hand… I used 2 Tbsp. apple cider vinegar instead of the lemon juice, light sesame oil instead of olive oil, and smoked paprika sprinkled on top. I do think peeling the chickpeas makes a difference, however i get lazy with it. If i’m making a dessert hummus I’ll definitely do it because it takes away some of the bitterness of the chickpeas and that’s what you want for a sweet hummus. 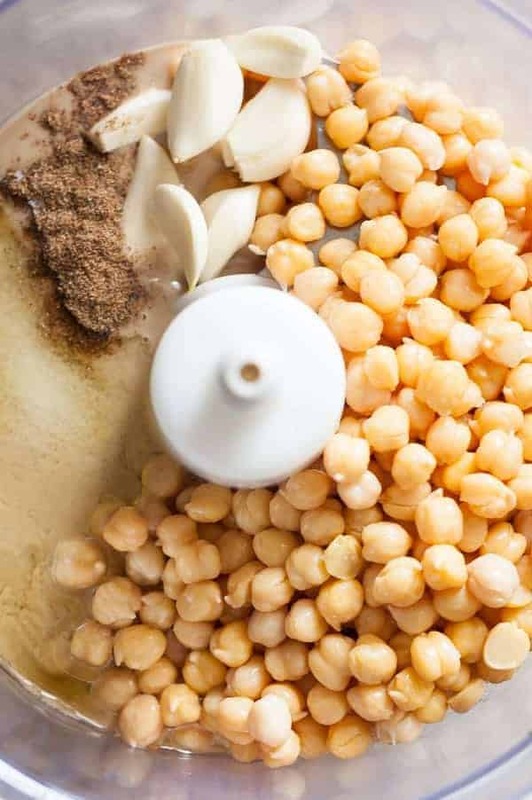 Occasionally I’ll put in the work for regular hummus if I’m really feeling like making it spectacular or if I have a lot of time on my hands – I’ll just jam out to some music or listen to a podcast while I peel the chickpeas. Yep. Sounds about like what I do! I’m glad you found us. Please let me know if you try the recipe and like it. I add tons of great flavor to my hummus by using infused olive oils like basil, oregano, garlic and sun-dried tomato in place of the plain olive oil. Then add a little on top to really complete the flavor combo. Works great with spicy red pepper infused olive oil for a little kick! Thanks for the suggestion! I’m sure it will help other people. I love hummus and I can’t wait to try this! I have made and loved many of your recipes and am following you now so I don’t miss a minute of your great site! I love making homemade hummus. Looks yummy! Hope your having a great week! Pinned & shared. Hope to see you again soon. I love hummus! This sounds and looks fabulous! This hummus recipe looks so pretty! I’ll bet it tastes great too. I’m thinking ai might have to whip up a batch! Ooo! So smooth and creamy! Love it! Smooth and creamy. I would add half the salt. If you’re using regular salt, you will find most of my recipes to be too salt, but I tend to use more Real Salt because it’s not as salty. It has more of a sweet, “real” taste and really just brings out the flavor of the food without making it salty. I highly recommend trying it if you haven’t already. Without a doubt one of our favorites too. Oh I just absolutely love your recipes and this one does not disappoint. It’s easy and delicious and good for my family! What type of processor do you have? I am scared to buy one that doesnt work? This looks delicious! I love hummus but have never actually made it. I’ll have to try this recipe, thank you for sharing! Yum!!! This looks delicious. I like the prep time! Excellent idea! I wouldn’t have thought of removing the skins…but would probably we worth the effort. p.s. Planning on going to check out your Pinterest page right now. I was looking for a hummus recipe as it is not really something I know or ever tried to make. This recipe looks easy and very tasty, will certainly give it a try! Just 1 question, how long will it stay fresh? and how should I store it? It will stay fresh for a week or so in the fridge. Thanks, Rebecca. I tried the recipe tonight…… super easy to make and incredibly tasty!! Hooray! We make it a lot too. We also like to throw in a roasted red pepper sometimes and then it’s even better. I have tried your recipe and it is wonderful. Thank you for sharing it. I am such a fan of Hummus and have to eat foods high in fiber. This sounds like such a great recipe. Thank you for sharing. I’ve never made it with peanut butter, but I can see where it would be good that way. I like roasted red peppers in mine. I love hummus. This recipe looks easy and wonderful. Never have been a fan of hummus ~ BUT, now I can truthfully say, this was delicious! Who knew you should take the husk/peeling/shell off of the garbanzo bean???? Well, it took about 8 mins to do the whole can, but it was well worth the time spent! I added Peruvian Lime Olive Oil, sea salt and a dab of horseradish. I figured if it had some of the things I really liked in it, then it might taste better…it did!!! For lunch I had it with red pepper, granny smith apple slices and carrots, plus Sea-salt and Black Cracked Pepper Rice Thins! Fully satisfied and can’t wait to make it and take it to an event this Saturday!!! I love your site too! Thanks. Just the thing for when I run out of tahini! Thank you! I make humus with garbanzo beans, lemon juice, garlic, olive oil, pickled roasted red peppers, red pepper flakes and PB2. I use 1 TBSP of PB2 and a 2 TBSPs of Olive oil. PB2 is dehydrated peanut butter with 75% less fat. It’s fabulous and for those peanut butter lovers out there, it’s the cat’s meow :-). PB2 can be found in the natural/whole foods section of stores like Kroger. Sounds great! I’ll have to try that. Thank you, I love hummus and have wanted yo make my own but can never find tahini. I love hummus and tahini, but this sounds yummy too! I’m glad to find a hummus recipe that does not require tahini! I don’t always have easy access to buying tahini, so this will be a life-saver! Thanks!! Plus, I personally don’t like the taste of Tahini so I’m glad we could help you out!